HANA Tutorials: SAP HANA Installation planning. This is first part of our three part series of SAP HANA installation tutorial. The best place to start the planning for any SAP system is with SAP product master guide and HANA is not an exception.We will recommend you to read following document to introduce yourself to SAP HANA and various installation options. HANA Installation and update guide. HANA release specific SAP note. HANA Master, Installation and Update guides. The central place to find these documents is help.sap.com(http://help.sap.com/hana_platform/#section2) . PFB the direct link for these documents. 1514967 - SAP HANA: Central Note : Refer this SAP HANA central note, this will provide you link to key SAP HANA revision notes. For every HANA revision , SAP releases a note for that particular revision number . Please read these notes once you have decide the HANA revision/version that you are planning to install. For example following SAP Notes were release for various HANA revisions. PAM : PAM is the key tool for SAP product installation planning. Go to following URL and search for SAP HANA : https://service.sap.com/sap/support/pam . 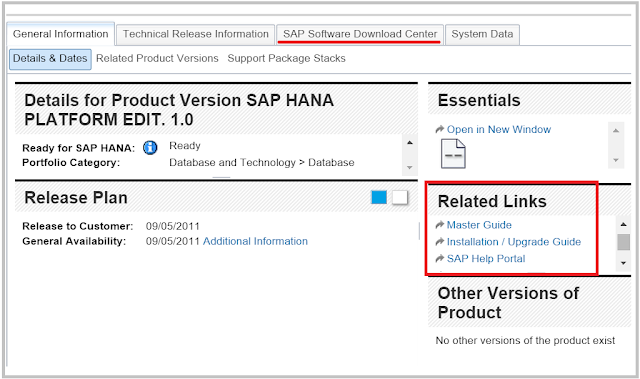 You can also find these docs links in SAP PAM(Product Availability Matrix) for HANA(shown below). These SAP documents are self-explanatory and very comprehensive , We will refer the key points form these documents in our next document. Make sure you read them before you jump to our next tutorial - "Downloadingthe required media and preparing the system".